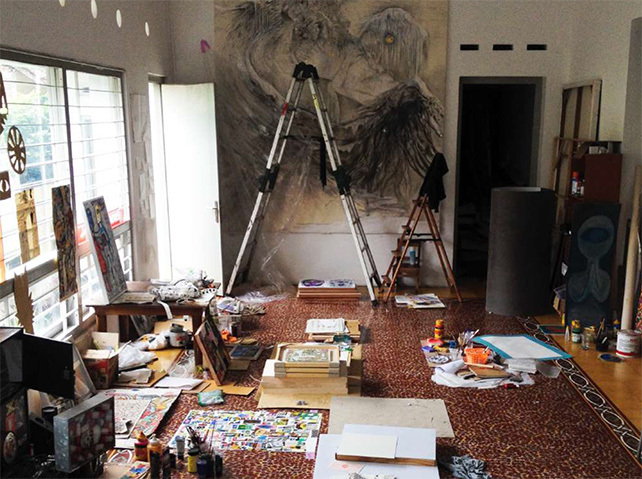 Artist’s studio in Rumah Kijang Mizuma, artworks by Aiko Yamamoto and other artists, photograph taken in 2015. Rumah Kijang Mizuma is a co-working studio and artist residency space founded by Executive Director of Mizuma Galleries, Sueo Mizuma, curator Hermanto Soerjanto, and artist Angki Purbandono in 2014. With the vision of having a space endorsing a cultural exchange that helps broaden the artists’ views and inspirations, the space was set in the southern part of the city of Yogyakarta, a bustling focal point amidst the regional art scene. This exhibition will feature new works by the Indonesian and Japanese artists with a curatorial focus on how their experiences with the art scenes, cultures, and social lives of Yogyakarta and Rumah Kijang Mizuma had influenced their views on art, art-making, and life. Artists: Agan Harahap, Aiko Yamamoto, Angki Purbandono, Eguchi Ayane, Fatoni Makturodi, Gilang Fradika, Kumazawa Mikiko, Okada Hiroko, Okamoto Ellie, PAPs (Prison Art Programs), Ryuki Yamamoto, Tsutsui Shinsuke, Yoga Mahendra, and Yuna Ogino.